The Rebel, The Sage and The Saint: this year's Reggaeville Easter Special combined three extraordinary singers from different corners of the world, each one with their unique approach to Reggae music, each one with a complete band to back them. No wonder this array of talent drew around 900 people to Hamburg's legendary Fabrik on Good Friday, people who made for an audience as diverse as the artists. Old and young, colourful and plain, dreadlocked and shaven alike crowded the venue when, a few minutes past nine, a rackety Intro announced Nattali Rize and Band. 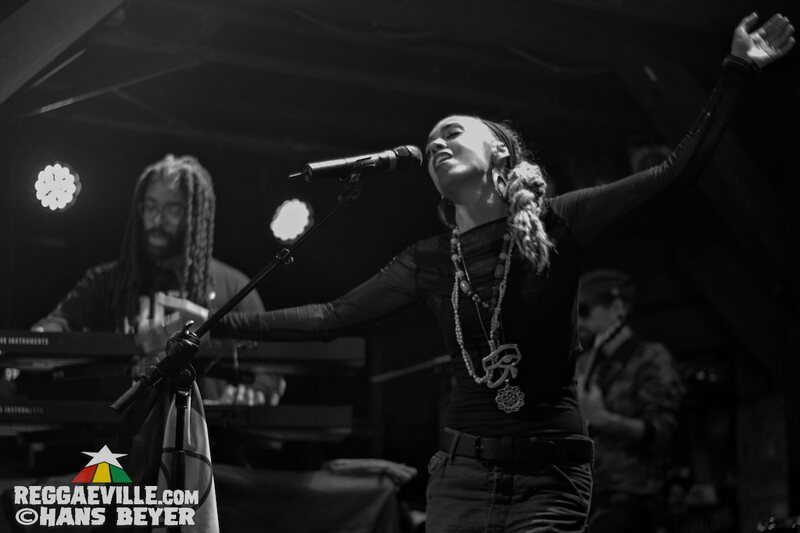 As last year, the band consists of Steven Maxwell on keys, Sparrow on bass, Yello on drums and One Rebel on guitar, and as last year (when opening for Chronixx), they have no difficulty to channel the energy of the expectant crowd into movement. Nattali delivers five songs off her freshly released album Rebel Frequency (next to the title track, we hear Warriors, Heart Of A Lion, Natty Rides Again and One People), as well as five older pieces including New Era, Renegade and Mountain. The latter she accompanies on guitar while singing, further revealing her instrumental skills during a short drum-solo later on. Right before that, the singer cast a spell with a powerful rendition of One People, a song that had most hands waving and countless voices singing along. Magic vibes! For me, this one has the potential to become the next Redemption Song. Going far beyond the typical phrases other artists manage to bring across in German, Nattali then delivers a complete speech, talking about the importance to stand up against injustice and corrupt governments. Closing this energetic 60-minutes-set with the pounding drums of Mo Truth, Nattali Rize and band wave their good-byes and make room for a quick change-over. Oh, and in case you wonder who the good-looking, vocally gifted young man might be that joined Nattali in Rebel Love – his stage name is Zuggu Dan, a member of the In.Digg.Nation Band in which he plays guitar. He thus appears again a mere 15 minutes later, joining his fellow instrumentalists Peter "Kongz" Samaru (drums), Lamont "Monty" Savory (guitar), Donald "Danny" Dennis (bass), Paris Dennis (keyboard) as well as Keiko Smith and Racquel Stephenson, who are more fore- than background singers. As soon as Protoje himself appears with I&I, the place is on fire, and the next two songs Resist No Evil and Protection already resonate with sing-alongs from the crowd. The singer is present as ever, easily communicating with both band and audience, prowling the stage from left to right, back to front, like the lion he is. Both vocal delivery, lyrical content and band performance are immaculate, and combined with the elaborate light-show as well as audience response, the magic evoked by Nattali Rize is amplified and taken to another level. Protoje leads us through his past four releases with tracks like Criminal, Can't Feel No Way or Rasta Love, arriving at his brand new single Blood Money. For a moment, Paris takes over with the chorus of Black Uhuru's Shine Eye Gal, further lashing the mood with a dance-interlude and calls of "Jump, jump!" 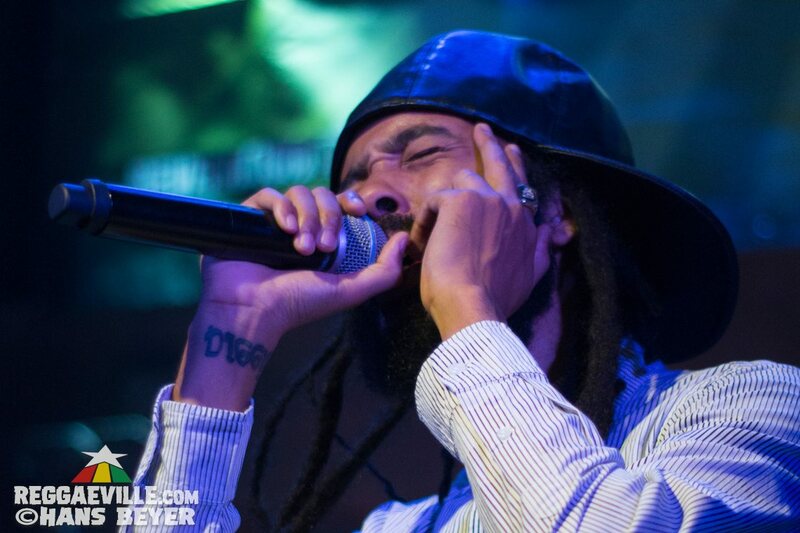 during Hail Ras Tafari. Into this boiling pot, Proto now drops Who Knows (instant pull-up!) and, right after that, Kingston Be Wise, both songs cumulating in frenetic screams and applause. Suddenly, a young man is there on stage with the artist, pointing into the crowd and asking for the microphone. When granted, he calls his girlfriend on stage, bends his knee, hands her a plastic bottle-ring and asks her to marry him. And she says yes! Everyone is cheering once more, and with that joyful atmosphere all around, Protoje withdraws from stage after a last chorus. What an amazing performer and amiable person, this one! During the next change-over (which takes twice as long as the last one), Hamburg's own Crucial B is on the decks once more, playing the city's hymn Brighter Days and testing the singing potential of the crowd with She's Royal. Even though some people are leaving already, the test is more than passed. At 12:30 am, an MC grabs the mic, telling us to join him on a journey through Reggae & Dancehall history. Riddims like Hot Milk, Bam Bam and No No No boom through the speakers, giving way to more modern versions of I'm Still In Love or One More Night. All along, he yells at the crowd, trying to bring the audience to a boil once more. 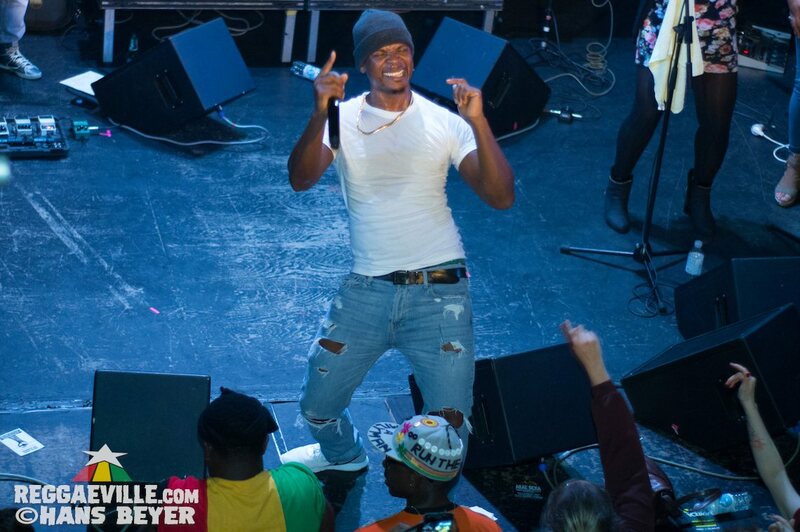 When the 330 Madness Band takes over from the DJ, Mr. Vegas appears in casual jeans, white T-shirt and beanie hat, jumping head-long into some of his biggest hits. The effect is slightly frayed by obvious vocal difficulties, so he takes a break to drink water while both MC and background-singers take over. The musicians bang at the audience with the typical backing-band drum-spree-Dancehall, and with Heads High, both singer and voice are back. What follows is a ride through more cover-versions than genuine Mr. Vegas tunes, including Buffalo Soldier, Gimme A Light, Row The Boat, Ska Ska Ska and even the likes of Ed Sheeran and Jason Derulo. After the excess amount of lyrical finesse and expert musicianship the previous two acts delivered, this DJ-focused performance stands in sharp contrast and only serves to create a kind of donnybrook vibe. Gratefully, the beer consumption at that point is high enough to have people cheerfully singing along, but more and more are leaving even before Mr. Vegas finishes his show. Only at the end of his set, the singer returns to his own tunes, sharing Gospel-influenced songs with us, some of which might already herald the upcoming album Soul Therapy. It's actually surprising that his show wasn't highlighting these tracks more, given that the artist declared that he will turn his back on Dancehall after the release of his 2016 album This Is Dancehall, having found God and all. Still, the groovy sounds of Protect Me or Nobody Greater make for a fine farewell, and at 1:45 am, Mr. Vegas leaves the stage drenched in sweat to a final applause. The place empties quickly then, and I join some friends who are heading towards the official aftershow-party run by Sillywalks Discotheque at the Volt club. Here, dancing is a must to the sounds of our beloved music, and we do so almost until dawn breaks. Revolutionary, wise and pious words accompanied us through this evening, creating yet another precious memory of an exuberant celebration of Reggae music. Thanks to Revelation Concerts and Reggaeville, to artist promoters and tour managers, to the venue crew and the bus driver, and of course to the artists and their musicians – it was a blast!! !